When a sinister old woman leaves Griffin Penshine a box of twelve shiny pennies, she sets in motion a desperate quest—because the old woman was a wish stealer, and each penny represents a wish she stole from a wishing fountain decades earlier. Somehow, Griffin has to make things right, or the opposite of her own wishes will come true—and it could literally be a matter of life and death. The Wish Stealers introduces a new voice in middle-grade fantasy, as bright and sparkling as Griffin’s pennies. TRACY TRIVAS, a graduate of Dartmouth College, won a Dartmouth Graduate Fellowship to study Victorian Literature at Oxford University, England. She received her Masters Degree in English from Middlebury College. She directed a Gifted and Talented program in a Los Angeles private school and has published gifted and talented workbooks as well as an adult non-fiction book, A Princess Found. The Wish Stealers is her first book for children. She lives in California with her family. "Trivas composes a nifty little tale, in which the magic of wishes and curses believably coexists with the dramas of middle school. The supernatural elements are certainly entertaining, but the real star of the story is the charmingly eccentric Griffin and her ability to navigate the perils of the sixth grade’s social ladder while dealing with an unlucky enchantment." 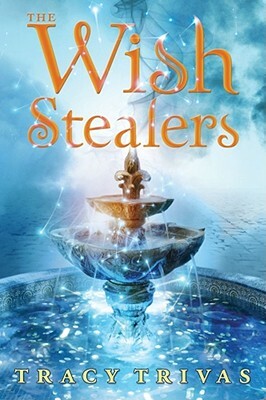 "The best thing about The Wish Stealers is the originality of its plot. Griffin’s dilemma is unique; readers will enjoy reading about her attempts to return the wishes while trying to navigate the trials of middle school. There is also a short inspirational quote at the end of every chapter—a nice touch."